The special Navratri thali includes samak rice, kuttu ki puri, sitaphal ki sabzi and mixed fruits. Enjoy Navratri Special food at restaurants across Delhi-NCR as many restaurants have revamped their menu to offer “Saatvik Menu”. EGO 33, a restaurant serving Indian and Continental cuisine located at NFC market is offering customers Navratri special thali. The delectable meal menu offers saatvik menu with tempting options of snacks and savouries such as Kuttu Poori served with Kaddu ki Sabzi, Aloo Dahiwale, Paneer Makhani, Aloo Saboodana ki Tikki, Ratia,Salad and Saboodana Papad. At the same time customers can relish Vrat ki Navratra thali at The Mix by the BrewMaster. To mark the fun-filled nine days Navratri festival marking fasting and feasting, The Mix by the BrewMaster has introduced a special vrat ki Navratri Thali. Designed to cater to both traditionalist and modern who look to try the traditional food, it serves the pure satvik food meeting all the fasting norms. Priced at Rs 299 plus taxes, this special Navratri Thali will be available from 21st March to 28th March and will be served both during lunch and dinner. Thali will have complete authentic vegetarian meal comprising of Kuttu ki poori, Samak ke Chawal, Aloo Jeera, Shahi Paneer and Kaddu ki sabzi along with delicious sweet dishes like Sabudana Kheer, Rasmalai and Fruit Salad. In addition to all these; Salad, Sabudana papad and sweet Lassi will be served to complete the offering. The Ancient Barbeque located at NCR is also offering a nine day special menu with some tweaks. Meanwhile, food chains known for serving vegetarian delicacies like Evergreen, Bikanervala and Haldiram's are also offering sumptuous food chaats and thalis during the fest. The special Navratri thali includes samak rice, kuttu ki puri, sitaphal ki sabzi and mixed fruits. 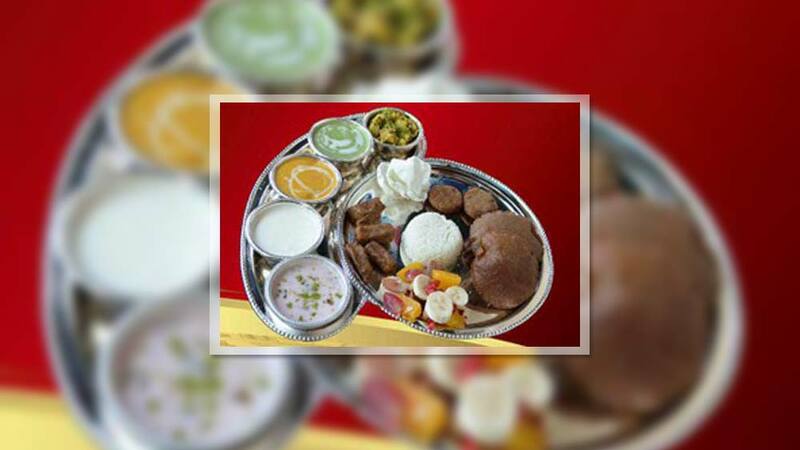 Thus we can see that Navratri will not only keep people fasting but also feasting on these special delights.